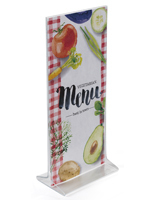 These plastic and discount sign framing solutions are great for restaurants, hotels or any other point of purchase display needs. 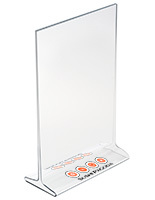 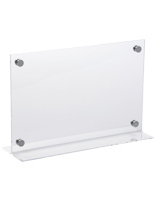 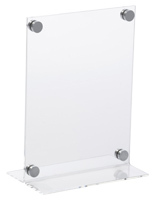 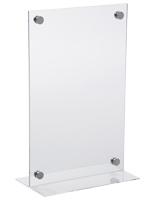 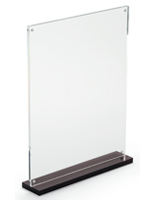 We offer these clear sign and menu holders in a variety of sizes to meet your particular needs. 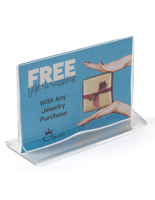 The transparent design of the acrylic or plastic assembly makes the plastic sign frames a great choice for merchants and advertisers in any industry. 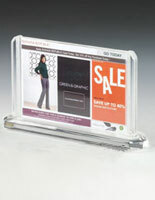 Retailers can promote ongoing sales, while hotels can feature room pricing or reservation details. 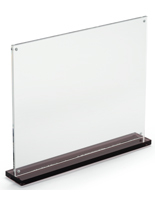 Banks often show current rates for savings, checking, and certified deposit accounts. 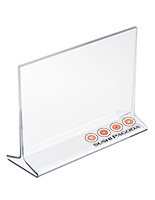 Set the see-through sigh holders atop any counter, checkout area, or service desk to feature pertinent details no matter what your industry is! 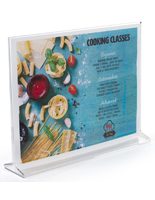 One of the interesting features of these plastic sign frames is that they are formatted specifically for portrait or landscape formatted prints. 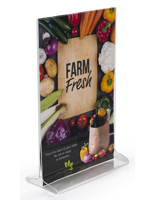 Each design will hold either a vertical or horizontal insert, so promoters can get the specific look they desire from their displayed signage. 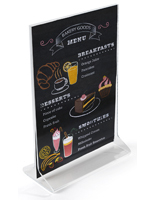 Why limit your business or organization's ability to develop unique and exciting signage? 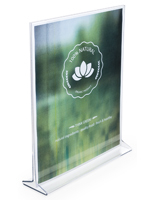 Get the frame with the right orientation, so you can get your message out exactly the way you want. 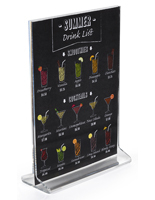 Perhaps the most distinguishing feature of this sign frame collection is the open top design. 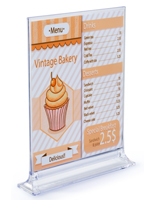 Signage is easily and quickly inserted through the top channel, so updating information can be done of the fly. 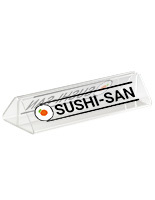 Many restaurants and service establishments love this feature! 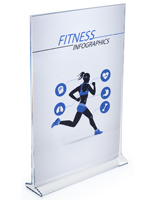 Users can even place printed graphics back-to-back for double sided viewing. 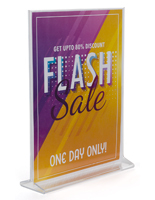 Double your impact with any of the two-sided sign displays. 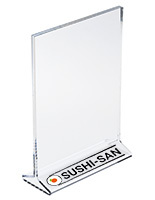 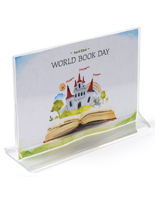 These plastic sign frames, also known as open top acrylic holders, are very popular with restaurants and retail stores. 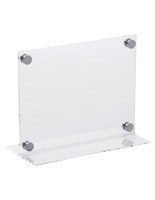 In addition to these acrylic print holders, we offer many other framing solutions including clear bases where users can insert a heavy stock card or laminate paper. 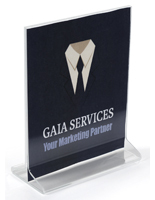 We offer these bases for 4" x 6" and 8.5" x 11" graphics. 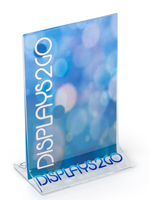 The holder bases, clear acrylic displays, and other plastic sign frames in this series are some of our best selling retail fixtures. 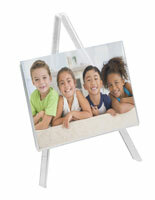 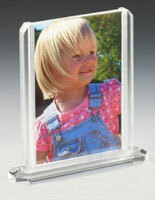 In addition to the products seen on this page, view the huge selection of other framing options. 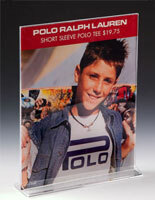 These clear displays can be used in a wide variety of businesses. 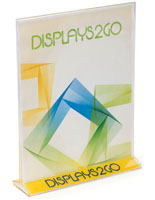 Browse the full spectrum of point of purchase displays which can be viewed at the main shopping page. 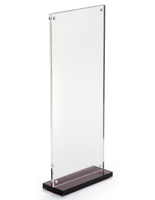 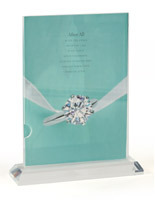 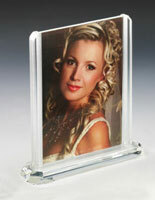 As a manufacturer we also have the ability to customize acrylic displays just for you. 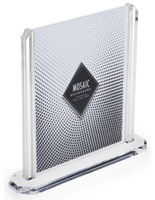 Add your logo, product or company name to make a truly unique design.